This may come as a shock to you but not many couples celebrate their 30th wedding anniversary with a party! We thought that was too shocking and thought it was time to put that right! If you were married in the eighties, you know how to party and whether it is a big extravagant dinner dance or a more relaxed party at home, an invitation makes a party feel important. And 30 years together is important! Your 30th anniversary is traditionally celebrated with pearls so we have included those in some of the designs and from the modern list with diamonds! So a sparkly party wouldn't go a miss. 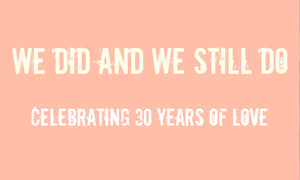 We have also put together some party ideas for your 30th with ideas for decorations and themes. Just click on the images and you will be taken to a pdf that you can print at home. You could also add a photograph of the two of you on the front of the invitation or have a then and now photo. The wording in your invitation is going to be much the same as any anniversary. We have put together samples from formal to fun for you here. Your 30th anniversary might be a time when you want to renew your wedding vows and then your invitations may need to be more formal so your guests know what to expect.